Cleaning a carpet can be a challenge. ​One of the important keys is to get at stains and other dirt early, so they don’t have a chance to settle. Once stains have settled, they can be difficult to remove and forever ruin an otherwise perfect carpet. Sometimes, stains do settle. In these cases, you need professionals. Fortunately for you, we provide a revolutionary and effective way to clean even tough stains from your carpet. Call us for the great results that come with an expertly-done steam carpet cleaning Perth. Steam cleaning produces the best possible results, as well as being safe for family and pets. The steam breaks down even the most stubborn stains, but without doing any damage to the fibres of the carpet. The result is a cleaning job that is safe, and effective. A steam cleaning uses a dry vapour steam. This can sanitise and disinfect while also attacking stains, making it ideal for both harder surfaces and softer materials. However, it is best used as a “spot” cleaning, targeting specific areas, for carpeting. The temperature of the steam kills mould, fungus, and bacteria. 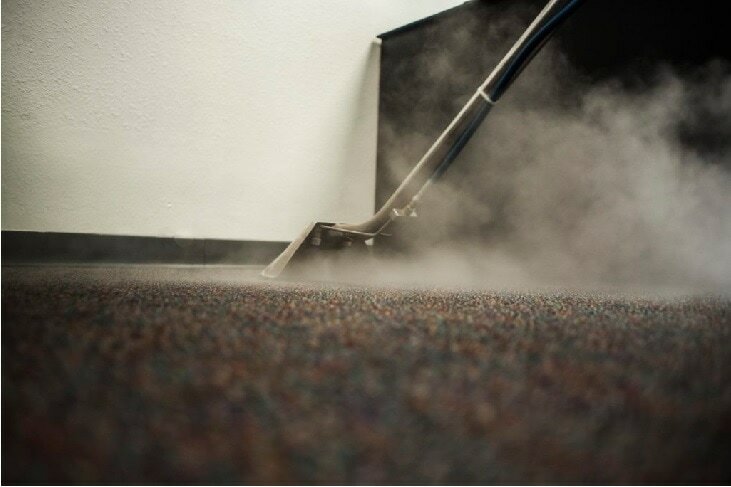 The steam loosens dirt in soft fibres, so what follows is either wiping or vacuuming. Depending on the needs of the situation, we may use only water or include cleaning solutions and detergents into the mix. After we perform a steam cleaning, our carpet cleaning team will wipe or brush away anything that remains. The result will leave your carpet stunning and spotless, free of any stubborn marks or blemishes. At the same time, you can rest assured it suffered no damage. The use of steam cleaning is a great way to make your old carpets look and feel new again. We will bring our steam cleaner, along with brushes and other cleaning materials when you call us.